Click on questions below to show answers. Q: I work for a small independent retailer. From time to time we conduct alcohol tastings. Do the members of staff who serve customers with the samples need to be over 18? A: It’s an offence to allow a person under 18 to sell, supply or serve alcohol. There are two exceptions, neither of which assist you. No offence is committed where a person under 18: (1) sells alcohol for consumption off the premises; or (2) supplies or serves alcohol for consumption on the premises with a meal. In both cases, there must be specific authorisation: (1) by a responsible person; (2) or a person aged 18 or over who is authorised by a responsible person. At the risk of appearing pedantic, I ought to add that staff members involved in tastings do not need to be over 18. No offence is committed provided they have reached that age. Q: Is it acceptable for members of a private club to bring their own bottles of spirits onto the premises to consume on special occasions such as New Year’s Day? A: There’s nothing to prevent that arrangement provided, of course, that it’s sanctioned by the club’s management committee, but particular care should be taken to monitor members’ consumption. The normal ‘signing-in’ procedure applies where a club is of a type that has taken advantage of certain dispensations set out in the Act and thus requires to operate under prescribed rules (except where an occasional licence is in force). The procedure must be observed where a non-member is supplied with alcohol. It also has to be kept in view that alcohol can’t be consumed outwith licensed hours, even on ‘BYOB’ basis. For technical reasons, the usual drinking-up time can’t be allowed: that’s only permitted where alcohol has been sold on the premises during licensed hours. Q: My personal licence is due to expire on August 31 and I know I need to get a renewal application submitted well ahead of the May 31 deadline. When I was looking for training, I came across a college website suggesting that a personal licence was needed by anyone serving alcohol or “working behind a bar”. All staff in my pub have been trained on the two-hour course but there are only two personal licence holders. Are we complying with the law? A: A personal licence authorises an individual to supervise or authorise the sale of alcohol. All licensed premises (apart from particular types of clubs) must have a premises manager who holds a personal licence. Certain late-opening premises require to operate with a personal licence holder in attendance from 1am. Otherwise, those selling or serving alcohol need only have completed the mandatory two-hour training; they do not require to hold a personal licence. It is disappointing that people training the trade don’t seem to have a grasp of the basics. Q: I took my eye off the ball and didn’t complete refresher training in time resulting in my personal licence being revoked. To maintain my employment as a duty manager I need to get this sorted quickly. Is there still a five-year ban in making a new application? Can I use the training qualification I obtained in 2011? A: The automatic five-year ban was lifted in the wake of the refresher training meltdown in 2014, so there’s no problem on that front. However, you can’t ‘recycle’ your qualification. A new accreditation document issued by the Scottish Government stipulates that a personal licence application must now be supported by “the qualification, first introduced on August 1, 2013, and known as the Scottish Certificate for Personal Licence Holders”. Q: We’re a small charity starting a social enterprise business and hoping to sell a locally-brewed beer in a gift shop. It would be the only alcoholic product on sale and usually packaged in a presentation box with glassware. How do we stand in terms of licensing? A: I’ve received a number of readers’ questions recently that seem to point to a belief that very small sales of alcohol may be exempt from a licensing requirement. In fact, with very few rare exceptions (eg. airside shops at airports) a premises licence requires to have been granted under the Licensing (Scotland) Act 2005. Looking at the modest nature of your proposal that should not be a difficult exercise but it will generate some expense.”. Q: Is it illegal for a shopkeeper to sell alcohol on the slate? A: When I answered a similar question a few months ago, I explained that the Licensing (Scotland) Act 1976 banned credit sales (with a few exceptions), but no similar provisions appear in the Licensing (Scotland) Act 2005. In the interval, there has been a development. One licensing board has taken a position on the matter in its latest licensing policy statement. It has become aware that a small number of off-sales in its area supply alcohol with payment deferred to a later date. This is considered to be a breach of the “public health” licensing objective as it may contribute to vulnerable persons’ alcohol dependency and lead to harm. While there’s no gainsaying the laudable intention behind this approach, I rather doubt whether it has a sound legal basis. It seems to me that if the parliament decided to abandon the ban on credit sales, that’s pretty much the end of the matter. In fact, one might say that, on the board’s reasoning, credit card purchases of alcohol ought to be prohibited on the basis that they could be used to buy large amounts of drink on long-term credit.”. A: There’s no law as such requiring beer garden customers to be seated; but in this case the licence holders were, it seems, complying with a so-called “local condition” attached to the premises licence by the Glasgow board. This provides that, “Where the outdoor area is situated on a public footway, it may only be used for the consumption of alcohol by customers seated at tables”. The condition is designed to address the potential for public nuisance that might be caused by “vertical drinking”. A: As a starting point, if the licence allows the sale of alcohol for consumption off the premises then that activity is permitted by the Licensing (Scotland) Act 2005. However, that’s not the end of the matter. Most local authorities have published byelaws making it an offence to consume alcohol in “designated” public places. The actual wording of the byelaws varies from area to area. But typically they will provide that an offence is committed by any person who consumes alcohol in a designated place or is found in possession of an open container containing alcohol. So, the lid arrangement might address the latter offence; but customers would have to be warned that drinking their toddy al fresco exposes them to prosecution – and that, I think, makes your idea highly inadvisable. 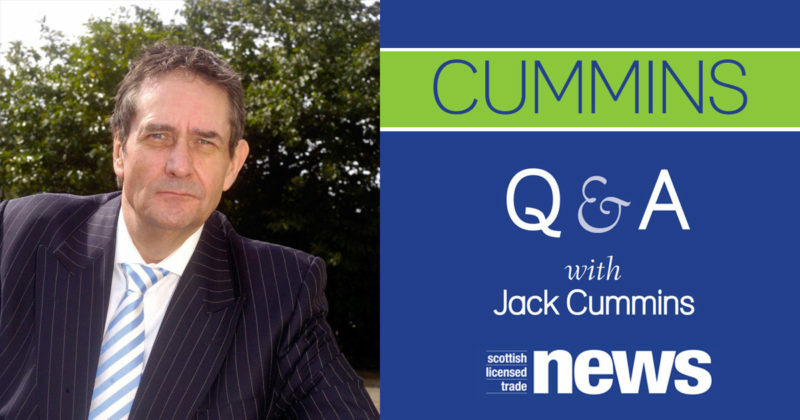 *Jack Cummins is unable to enter into personal correspondence on readers’ questions. The advice offered in SLTN is published for information only. No responsibility for loss occasioned by persons acting or refraining from action as a result of material contained on this page or elsewhere in SLTN can be accepted by the author or publisher.